183 Beacon is located on the south side of Beacon, between Berkeley and Clarendon, with 181 Beacon to the east and 185 Beacon to the west. 183 Beacon was built ca. 1863, one of two contiguous houses (181-183 Beacon), designed as a symmetrical pair with arched entries. They were originally numbered 179 and 181 Beacon, but were re-numbered as 181 and 183 in about 1868, after a new house had been built immediately to the east and numbered 179 Beacon. Click here for an index to the deeds for 183 Beacon. On April 9, 1862, Henry Whitwell sold the western half of the lot to Nathaniel Silsbee, where he and his wife, Marianne Cabot (Devereux) Silsbee, built their home at 183 Beacon. Henry Whitwell retained the eastern half where he had 1881 Beacon built for speculative sale. Nathaniel Silsbee was a former shipping merchant in Salem and had served as a Member of Congress from Salem in 1833 and 1846. In 1862, he and his wife moved to Boston from Salem when he was named treasurer of Harvard College. They lived briefly at the United States Hotel while 183 Beacon was being completed. The Silsbees continued to live at 183 Beacon in 1869, but by 1870 had moved to a new home at 237 Beacon. On March 7, 1870, 183 Beacon was purchased from Nathaniel Silsbee by attorney Franklin Howard Story, Jr., He and his wife, Adeline (Wainwright) Story, made it their home. They previously had lived at 20 Chestnut. Their two children, Elizabeth Gray Story and Marion Wainwright Story, lived with them. Elizabeth Story married in September of 1875 to Edward Gray. a cotton broker. 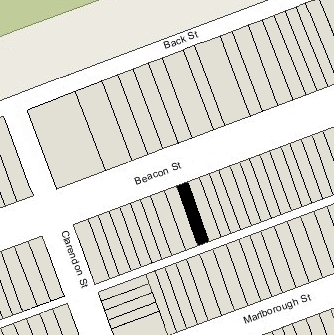 After their marriage, they lived briefly at 183 Beacon with her parents, and then moved to 71 Marlborough to live with her grandmother, Elizabeth Gorham (Gray) Story, the widow of Franklin Howard Story. Marion Story graduated from Harvard in 1879 and moved to New York City in the early 1880s, where he became a stockbroker. Franklin and Adeline Story continued to live at 183 Beacon during the 1888-1889 winter season, but moved soon thereafter to Charlestown. On April 23, 1889, 183 Beacon was purchased from Franklin Story by Thomas Niles, jr.
Thomas Niles, Jr., was a publisher in partnership with Lewis A. Roberts in the firm of Roberts Brothers (Thomas Niles, Jr., was the half-brother of Lewis Roberts’s first wife, Alice (Niles) Roberts) and is credited with suggesting to Louisa May Alcott that she “write a girls’ book” for his firm, the resulting work being Little Women. A bachelor, he lived at 110 Beacon with his cousins, Emily Hale Niles, Anna Hale Niles, and Sarah Fowle Niles, the daughters of William Jenkins Niles and his wife, Mary Ann (Hale) Niles. Thomas Niles, Jr., died in May of 1894 while traveling in Europe with the Niles sisters. In his will, he left the bulk of his estate to them, and left smaller amounts or nothing at all to his siblings. After a highly-publicized legal challenge, the will was sustained by the courts. Emily, Anna, and Sarah Niles continued to live at 110 Beacon; their brother-in-law and sister, Dr. Ferdinand Gordon Morrill and Arria (Niles) Morrill, lived at 181 Beacon from about 1889 until about 1907. By the 1889-1890 winter season, 183 Beacon had been leased from Thomas Niles by Dr. George Brune Shattuck and his wife, Amalia Diaz de la Torre (Schutte) Lavalle Shattuck. They previously had lived at 24 Marlborough in 1889. They also maintained a home, Eaton Cottage, in Beverly Farms. George Shattuck was a physician and editor of the Boston Medical and Surgical Journal. He also maintained his medical office at 183 Beacon. John Lavalle and Rosita de Lavalle — Amalia Shattuck’s children by her first marriage, to Juan Lavalle — lived with the Shattucks. Rosita de Lavalle married in June of 1893 to Arthur J. Richmond; after their marriage, they lived at 5 Chestnut. John Lavalle, an architect, married in May of 1895 to Alice Cornelia Johnson; after their marriage they lived at 123 Marlborough with her widowed father, Edward Crosby Johnson. Emily Niles died in September of 1908 and Anna Niles died in June of 1911. Sarah Fowle Niles inherited their shares of 183 Beacon and continued to lease the house to the Shattucks. Amalia Shattuck died in July of 1918. George Shattuck continued to live at 183 Beacon during the 1920-1921 winter season, but moved thereafter to 68 Beacon. On October 7, 1921, 183 Beacon was purchased from Sarah F. Niles by Walter Howard Gleason and his wife, Mabel W. (Robertson) Gleason. They previously had lived in Watertown. They also maintained a home in South Yarmouth. Walter Gleason was an attorney, real estate dealer, and investment broker. The Gleasons continued to live at 183 Beacon until about 1933, but moved thereafter to 188 Beacon. They continued to own 183 Beacon and lease it to others. By 1935, 183 Beacon was the home of Mary Florence (Edmonds) Lawton, the widow of Edwin W. Lawton, and her daughter, Mabel Edmonds Lawton. Edwin Lawton had been an ice and coal dealer in Ware, Massachusetts. They operated 183 Beacon as a lodging house. Mary and Mabel Lawton continued to live at 183 Beacon in 1936, but had moved by 1937. By 1937, 183 Beacon was the home of Eliza M. Smart, who operated 183 Beacon as a lodging house. Walter Gleason died in May of 1940. 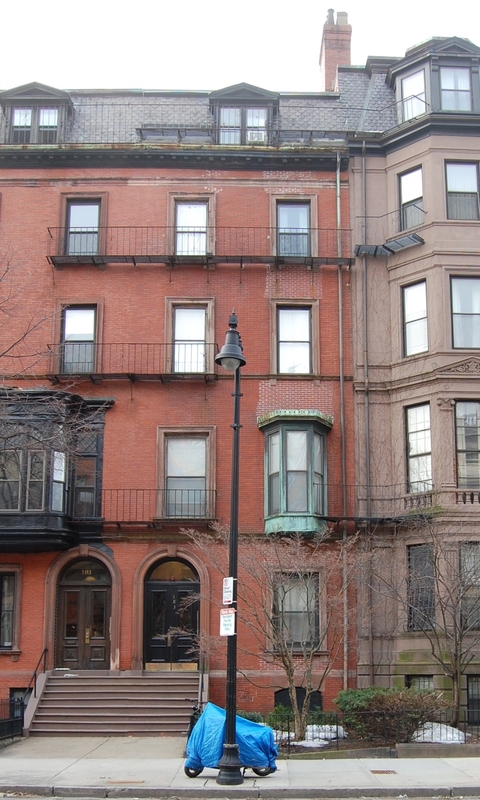 Mabel Gleason continued to live at 188 Beacon and to own 183 Beacon. Eliza Smart continued to live at 183 Beacon and to manage the lodging house for Mrs. Gleason. Mabel Gleason died in September of 1947. On September 29, 1947, 183 Beacon was acquired from Mabel Gleason’s estate by Chrystene Mae (Beckett) Volpe, the former wife of Harry Volpe, who operated it as a lodging house. She previously had lived at 2 Otis Place. Eliza Smart continued to live there as a lodger through about 1959, having become a nurse. Chrystene Volpe’s former husband, Harry Volpe (born Sam Wolper), had been a bootlegger in the 1920s. He became an informer to federal investigators and was credited with providing information that led to the indictment in March of 1926 of 112 men charged in connection with an interstate booklegging syndicate. He was murdered on September 17, 1931, in Providence. Harry and Chrystene Volpe had divorced by 1930, and in the 1940s she listed herself in the City Directories as the widow of Gregory S. Volpe. On January 28, 1949, 183 Beacon was acquired from Chrystene Volpe by Bennett Palmer Spear, Jr. and his wife, Phyllis E. (Rundlett) Spear. They lived in Danvers. 183 Beacon became the home of Bennett Spear’s mother, Doris Stowe (Wilder) Spear Levitan, the former wife of Bennett Palmer Spear and of Saul Bernhardt Levitan, from whom she recently had divorced. Prior to their divorce, Saul and Doris Levitan had lived at 18 Commonwealth, where she operated a lodging house. She operated 183 Beacon as a lodging house and also operated a lodging house at 83 Marlborough, where she had lived before her marriage to Saul Levitan in April of 1943. She used the name Doris S. Spear during and after their marriage. Doris Spear continued to live at 183 Beacon, and operate it as a lodging house, until about 1952. On March 9, 1954, 183 Beacon was acquired from Bennett and Phyllis Spear by Elizabeth French (Giles) Howard, the widow of John Philip Howard and former wife of Arnold Kargaard, and her daughter, Susan Giles Howard. They lived in Lincoln. Elizabeth Howard was a real estate agent. They continued to operate 183 Beacon as a lodging house. 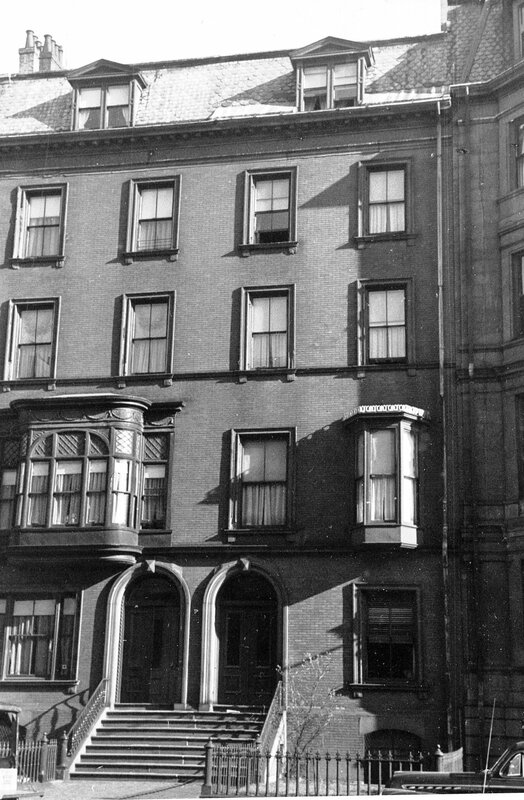 On April 9, 1957, 183 Beacon was acquired from Elizabeth Howard and Susan Gardner by Frederic J. Perry, who continued to operate it as a lodging house. On June 30, 1959, 183 Beacon was purchased from Frederic Perry by Fisher College. It had purchased 181 Beacon in June of 1953, and when it acquired 183 Beacon, it filed for permission to combine the two properties for use as a dormitory, and to replace an existing wooden shed behind the buildings with a new masonry addition which would be a dining and social hall. The permit was denied but the Board of Appeal granted Fisher College’s appeal on July 15, 1959. The college subsequently abandoned the project, however, and in August of 1959, it filed for (and subsequently received) permission to operate the property as a dormitory for 32 girls. The college continued to operate it as dormitory, Myron Hall, until the mid-1970s. On December 31, 1975, 183 Beacon was acquired from Fisher College by real estate broker and investor Patrick Glynn. 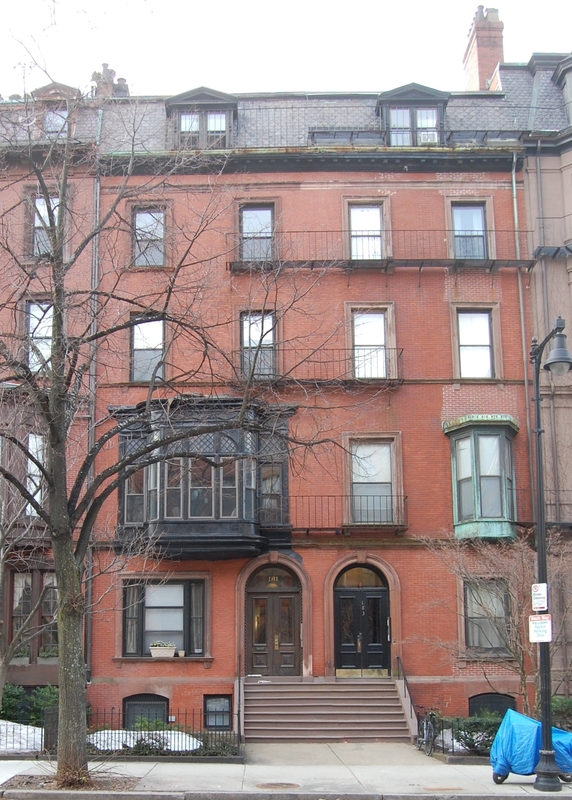 On January 22, 1991, he transferred the property to himself and his wife, Anne T. Glynn, as trustees of the 183 Beacon Street Trust. On December 31, 1996, the Glynns transferred the property to Glynn Real Associates IV, LLC. 183 Beacon remained an apartment house in 2015.